Display this window by using Navigation → Go to File…, or by pressing ⌘T. Much like the bundle item search window, here you enter a query which matches against the files in the project, and you can press ↩ to open that file. It also remembers query/file combinations, so that you can easily get to files you use often – and as an added bonus, it shows the files in the order they were last used, which means you can easily switch to the last file/tab you were in by pressing ⌘T and then ↩. Note: Pressing the disclosure arrow at the bottom left of the window will allow you to set up additional filtering by extension for the files displayed in the list. Another very useful function is the Navigation → Go to Header/Source, bound to ⌥⌘↑ – this moves to the next file in the project with the same base name (without the extension) as the current file. For example, when working on a controller file example.php and a template file example.tpl, (or an implementation file example.c and a header file example.h) then ⌥⌘↑ will switch between them. 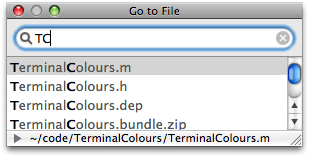 As always it’s worth checking through the bundle you’re using for useful commands – for example, ⇧⌘D is commonly used to open included files (e.g. in PHP, Ruby and Xcode), ⌥⌘↓ is used to open the current project in Xcode, and the Ruby on Rails bundle has many useful shortcuts for getting around your application’s files. Great TextMate tips, keep them coming! Ditto Yi Qiang’s comment. Thanks for these. Many thanks …. I just couldn’t remember that reveal command.